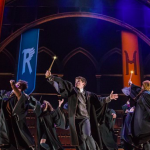 Most fans are familiar with the year-round magic of the Harry Potter series; each book beginning in summer and carrying through the school term to the following spring. Many know which seasons some of the wizarding events occur; Harry’s first Hogwarts letter arrives in July and the Yule Ball takes place at Christmas. Some aficionados may even know the fictional dates of their favorite Quidditch matches and characters birthdays. There are however, a couple of dates during the Harry Potter calendar which seem to be more magical than others. The first that comes to mind is September 1, the day that all young wizards head to Platform 9 ¾ to board the Hogwarts Express. Harry, Ron, Hermione, and company enter the school of witchcraft and wizardry for the first time on that date in 1991 and every September 1 for the next five years. Unfortunately, the trio miss the train in year seven in order to go hunting Horcruxes and Hallows. On September 1 1994, which takes place in Goblet of Fire, dastardly Barty Crouch Jr, Death Eater and son of Ministry of Magic official Barty Crouch Sr. abducts the fourth year Defense Against the Dark Arts Professor Alastor Mad-Eye Moody. He stows him away in a trunk and masquerades as the auror for the majority of the school year via Polyjuice Potion in order to do the Dark Lord’s bidding and guarantee Harry’s trip to the Little Hangleton graveyard. In Order of the Phoenix, September 1, 1995 is the day Harry meets Luna Lovegood on the way to Hogwarts for the start of his fifth year. He also has his first encounter with the reptilian, winged thestrals that day. As explained by his new Ravenclaw friend, these horse-like magical creatures are only visible to those who have witnessed death and Harry saw the murder of Cedric Diggory at the end of book four. More recently, September 1, 2017 was celebrated at King’s Cross Station and across the fandom as the exact date the Deathly Hallows epilogue takes place “19 years later” and Harry Potter and the Cursed Child begins, as covered here by Leaky. The other date that regularly rears its pointed hat-topped head throughout the series is October 31… Halloween. Halloween may be the most significant date in the canon, as that is where the story really begins in 1981 with the deaths of James and Lily Potter. After Harry’s parents graduate from Hogwarts, marry and join the Order of the Phoenix, they refuse to join Voldemort’s minion. They, along with their son, become the Dark Lord’s prime target due to Professor Trelawney’s prophecy about a boy who would be born at the end of July in 1980, that had the power to defeat him. On Harry’s first Halloween at Hogwarts in Philosopher’s/Sorcerer’s Stone, Harry and Ron aren’t speaking to Hermione and get to the Halloween Feast without her to hear Professor Quirrell announce there is a mountain troll loose in the castle. 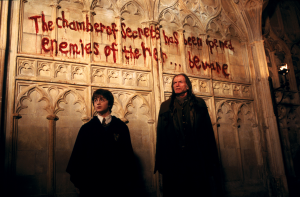 While the other houses are heading back to their dorms, Harry and Ron go to the girls’ bathroom to warn Hermione of the situation. 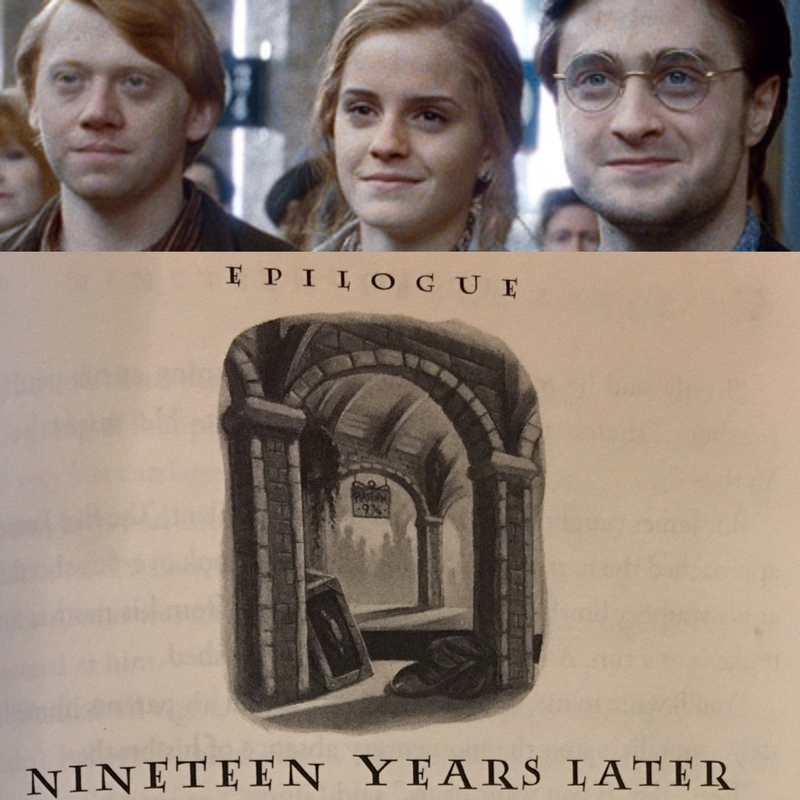 Unfortunately, they lock the beast inside along with Hermione trapped with it.Together the trio manage to defeat the troll and when Professor McGonagall scolds them for their actions, Hermione tells a cover-up tale that cements their friendships for the duration; definitely a catalyst moment in the Potter saga. In Chamber of Secrets Halloween summons double duty for Sir Nicholas de Mimsy-Porpington, otherwise known as one of Hogwarts’ resident ghosts, Nearly Headless Nick. 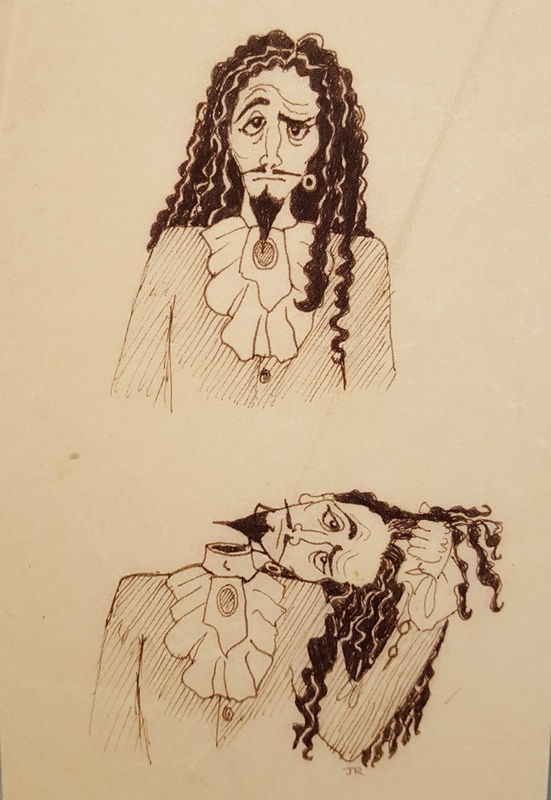 October 31, 1992 marks the 500th anniversary of Nick’s death by execution-gone-wrong, as well as the ghostly Death Day party he throws to celebrate the occasion. Nick arranges ghoulish gala, decorating the dungeon in a spooktacular fashion and providing a banquet of rotting food and a tombstone shaped cake for hundreds of his closest translucent friends. 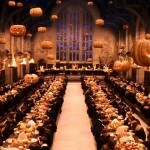 The guest list includes other Hogwarts apparitions like Peeves and Moaning Myrtle, as well as Harry, Ron and Hermione, who agree to spend their holiday in honor of Nick, while hoping to get the Great Hall in time for dessert at the Halloween Feast. 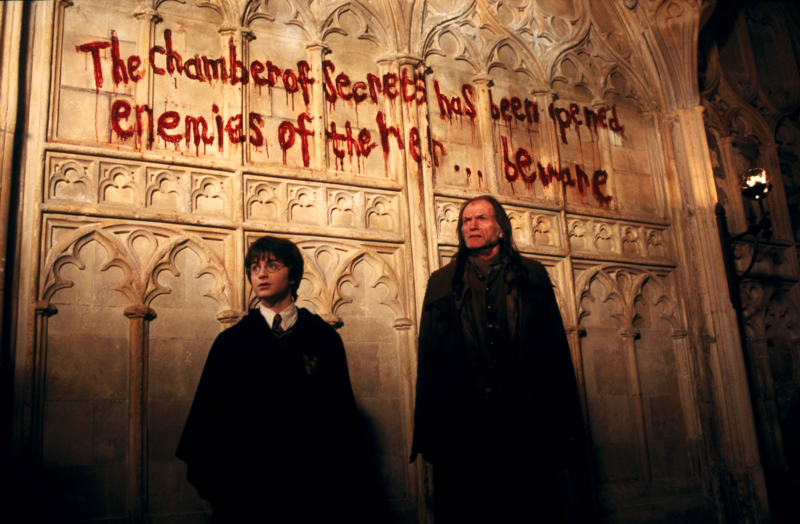 On their way from the party to the feast the trio finds another occurrence marked by Halloween; evidence that the Chamber of Secrets has been opened. They also discover Mrs. Norris hanging petrified from the ceiling. October 31st is another entrancing calendar entry In Prisoner of Azkaban. Halloween 1993 marks the first Hogsmeade visit for Hogwarts third-year students. Harry, who was unable to accompany his friends since Uncle Vernon wouldn’t sign the permission form, spends the afternoon getting to know Professor Lupin a little better over tea. Ron and Hermione bring him some consolation treats back from Honeydukes and the three attend the Halloween Feast together that evening. On the way back to Gryffindor Tower they are shocked to see that the Fat Lady’s portrait, at the entrance to their Common Room, has been slashed and the Fat Lady is missing. Later Peeves reveals that it was Sirius Black who was the culprit. This turn of events results in a monstrous Halloween slumber party in the Great Hall for all four Hogwarts houses. Image: © J.K. Rowling/Pottermore Ltd. TM Warner Bros. 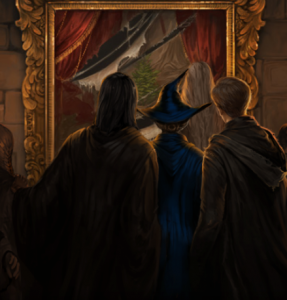 In Goblet of Fire on Halloween night 1994, the Triwizard Champions from Hogwarts and the visiting schools are determined when the Goblet of Fire shoots out the names of the students who will compete in the Triwizard Tournament. Hufflepuff Cedric Diggory is named from Hogwarts, as well as Fleur Delacour from Beauxbatons, and Viktor Krum from Durmstrang. A surprise to all; Harry is also selected, which causes bedlam since Harry is too young by decree to participate. Alas the Goblet’s decision is final, and the Chosen One shares the Hogwarts championship spot with Cedric. By definition, magic, the practice of most of the characters in Rowling’s stories, is the paranormal use of certain actions, gestures, language and rituals to manipulate natural forces. Halloween happens to be the one day of the year most universally influenced by supernatural concepts, so it’s no surprise that October 31 at Hogwarts would be a bubbling cauldron of otherworldly occasions. The customs of Halloween, or All Hallows’ Eve as it was originally known, which has Christian as well as pagan roots, have historically been surrounded by the metaphysical notions related to what we know as magic. The holiday ties back to the ancient Celtic Festival of Samhain observed on October 31 when those in Britain and Ireland marked the end of summer. It was thought that the souls of the dead would return to their earthly homes on this day The occasion became shrouded in superstitions, including the belief that witches, ghosts, demons, black cats, and other menacing beings were present. Festivities included games and rituals used to fortune tell and other forms of divination utilizing harvested food and bonfires. It was suggested that these fires were a kind of imitative or sympathetic magic, commonly known as voodoo. Some of these games regarded “imitating malignant spirits” which led to the contemporary customs of wearing costumes and playing pranks on this day. 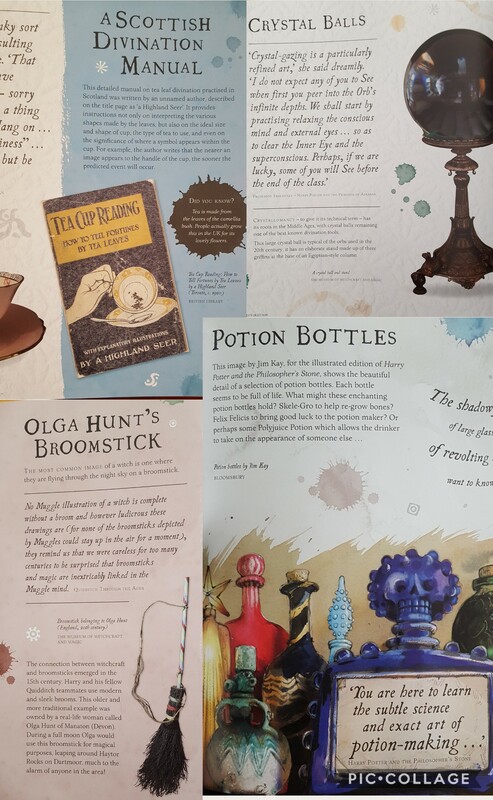 As explained in depth here by Leaky, the exhibit is divided into the various branches of magic, as seen through the Hogwarts curriculum, and explained from a real-world perspective. The exhibit provides actual connections to all of the wizarding classes fans have become familiar with through the series, from Potions and Alchemy, to Charms and Divination, Astronomy and Defense Against the Dark Arts and even Care of Magical Creatures; many subjects which are also associated with Halloween. 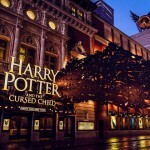 The realm Rowling chose to encompass her fictional world is certainly a mysteriously provocative force, and without a doubt, Harry Potter, Halloween and Magic conjure a bewitching triumvirate. Happy Halloween to all of you witches and wizards! Stay safe while you trick or treat and send us pics of your best Potter costumes!